Welcome to a new feature of FTTW: Saturday photography. Every other Saturday afternoon Shawna will bring you "Film and Developer: The Art of Black and White Photography"
One Saturday a month we will have someone write about digital photography. On the other Saturday, we will have a themed reader photography submission day. We'll announce the theme on Wednesday or Thursday and you'll send us your pics and we'll have some fun complimenting each other. More details to come on that next week. If you would like to do a one shot column on digital photography (we'd like to have a different author each week), please shoot us an email at submissions@fasterthantheworld.com. And now, Shawna's first Film and Developer column. Black and white. Two of my favorite descriptions of the absence of color and light are black and white. This is especially true in relation to photography. The highlights, the shadows, the shades of gray, all blended together in a way that absolutely fascinates my mind and directs my emotion. For me, seeing a good black and white photograph causes the same feeling that music does in others; stirs an emotion so deep its indescribable. You know, similar to the chills that you get when you hear a person singing who has an awesome voice? Yeah that. Same feeling. 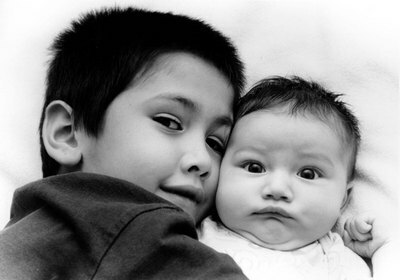 One of my favorite shots is of my baby girl and the brother who loves her dearly. I shot this with my old-fashioned Nikon FM 35mm camera, using old-fashioned T-Max 100 black and white film. I developed the film myself in a darkroom in Raleigh, NC and then printed it 8 x 10 on an old-fashioned Beseller enlarger, using one tray of developer, one tray of stop bath and one tray of fixer. The art of black and white photography – real photography, taken with film, composed in the eye and viewfinder alone, and using no computer graphics whatsoever – is a dying art. My goal here is to help keep this beautiful art form alive. awesome. Digital is fun and all, but nothing really compares to shooting a roll and then the surprises you get when you pick it up or develop it. One of these days, i'll have a darkroom again. That's a fantastic shot, too. I love b/w photography (I have my own set here, but I shoot digital). Your story makes me want to pick up the SLR again. I have a nice Minolta, but the daughter uses it for photography class. I may have to share it with her. I would love to contribute to this sometimes, as I have been shooting like a madman for the last 2 months and building my portfolio. Was a great addition to FTTW! Very nice photo shawna. I always loved B&W photography, esp. when I did my own developing and printing before I had to sell my equipment. It was always cool to watch the image come to life in the tray, and know you had control over how it eventually evolved. Brilliant Column. I truly believe that the best photographs that have ever been taken were all black and white taken using just standard 50mm lens. No flash, no fancy equipment. Just pure vision and emotion. I have a few photos i wouldn;t mind showing off here. Tim- I totally agree with you. This shot of my kids was a 50mm lens, natural light coming in the window and most of all, totally spontaneous. Thanks everyone for the compliments. I can't wait to do more posts! yay shawna! hi hi hi! all my favorite peeps are at FTTW!!! Kali, don't say peeps. That'll ruin your street cred faster than listening to Tori Amos. Dang I miss the darkroom now. B&W photography was all my college taught, and boy do I miss it now. My dad let me borrow his 30yr old Pentax with all the lenses and attachements for the classes. I was in heaven, and very nearly refused to give it back to him lol. Black & White photography, ... it is much like my first french kiss!! I just wanted you to know that I do visit your site, and that you are extremely talented. I hope your life is treating you well. I think of the old Vista days often. You are part of so many of those fond memories--I wonder if I'll ever see you in person again. Seeing Franklin and meeting his family was great.